Mojang has finally released a free demo of the full Minecraft experience. If you're one of the relatively few people that hasn't tried Minecraft yet, or even worse, ever heard of Minecraft, now there's an easy way to remedy that. Mojang has released a free demo so players can get the full Minecraft experience without having to fork over a single unit of the smallest denomination of their region's currency. 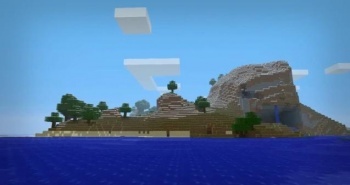 The demo gives players 90 minutes in a brand new Minecraft world. Every feature available in Minecraft is available in the demo. After 90 minutes, you'll either have to buy the game or say "bye bye" to whatever you've built. Players can evidently create as many new worlds as they wish, however. Minecraft already has a free mode, dubbed Minecraft Classic, but it's very out of date and doesn't give players much to do besides running around and placing blocks. The current paid version of Minecraft was recently updated to version 1.5 with the addition of weather, new rails, and the beginning of growing achievement and statistic tracking systems. PC Gamer has the exclusive on the demo for now, so if you'd like to download it, go here. I'm pretty sure that 75% of you already have Minecraft running in the background right now, but perhaps someone will have the need for this demo someday.